Let us start with the present record holder, the dinosaur formally described as the biggest known to science, at least for the time being. This honour goes to the South American Sauropod Argentinosaurus (Argentinosaurus huinculensis). This massive dinosaur was officially named and described in 1993. It is only known from a few incomplete bones, including a femur and some vertebrae, (backbones). The vestiges were found in Argentina, hence the name. The tallest vertebrae are over 1.2 metres high. In comparisons with better known Sauropods size estimates for this dinosaur have been complete. These estimates vary significantly, with some scientists suggesting that this dinosaur may have been over forty-five metres long and weighing something close to seventy tones. 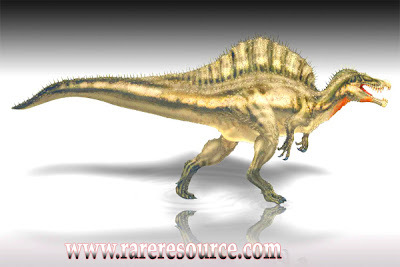 Other more traditional estimates as to the size of this animal have been made, with a length of a little over one hundred feet being agreed upon by some palaeontologists. It is surely, true that this Cretaceous giant was an enormous animal, but until more fossils are found the true size of this dinosaur can only be predictable. A number of museums have capitalised on the reputation of the largest dinosaurs and equipped mounted replicas of this particular giant. The largest of these museum exhibits measures over thirty-five metres in length, but here again, without more fossil proof this display is largely speculative.